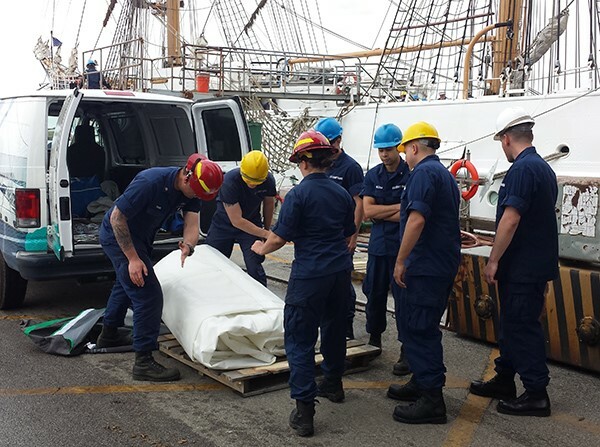 Quantum staff and Coast Guard crew unload one of the sails Quantum Annapolis made for the USCG Eagle. 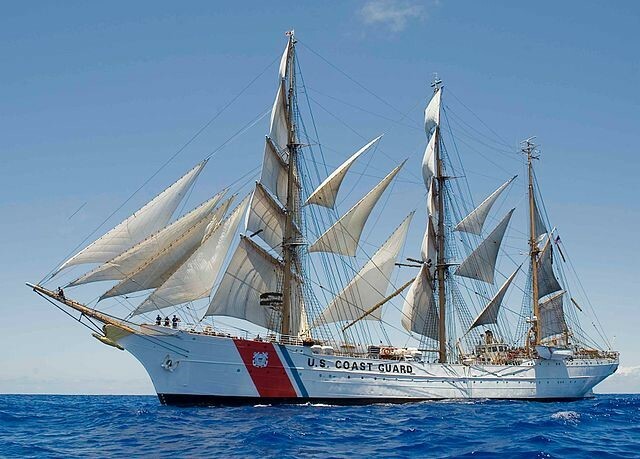 Built in 1936, the USCG Eagle serves the Coast Guard as a training vessel for academy cadets and officer candidates. The largest tall ship still flying the stars and stripes, the cutter uses 28 sails. This year, Quantum Sail Design Group helped replace two of those sails – a unique and memorable experience for any sail maker. The Eagle was originally a German Navy vessel. Taken as a war prize after World War II, a US Coast Guard crew sailed it to New London, Connecticut in 1946. Part of that crew included Lt. Roy M. Hutchins Jr., father to long-time Quantum rep Tad Hutchins. Today the Eagle is used as a training vessel for Coast Guard Academy cadets and officer candidates. Each sailor must learn to handle the more than 200 lines – almost six miles of rigging – and 22,000 square feet of sails. To make sure the ship is in good sailing condition, the Coast Guard replaces two sails each year. This year, Quantum bid on and won the contract to build a top gallant and inner jib at the Annapolis loft. Quantum’s National Service Director Charlie Saville said the experience provided many unique opportunities and challenges. “Most of the time we have a designer who uses a CAD program to design a sail,” he said. “They’ll design it in 3D and the computer spits out all the details – you need to make panels like this and that. You’re basically putting the pieces of a puzzle together. That’s how almost every sail is made these days. Quantum designer Doug Stewart, however, is skilled in that art form. He designed the gallant and jib with the help of a 16-page design brief provided by the Coast Guard to make sure the sails were made consistently with their current sails. After drafting the sails and rolling out the cloth, the material went to the Newport, Rhode Island loft for assembly before returning to Annapolis for the handwork and detailing.